Background & objectives: Increase of vector-borne diseases (VBDs) in India has posed a question on the situation in Lakshadweep Islands, where VBDs are reported from time-to-time. The present investigation was aimed to assess the faunastic situation of the prevailing vectors along with their breeding sites in different islands of the Lakshadweep. Results: A total of 3356 mosquitoes were collected during the study period which comprised of 16 species from nine genera. 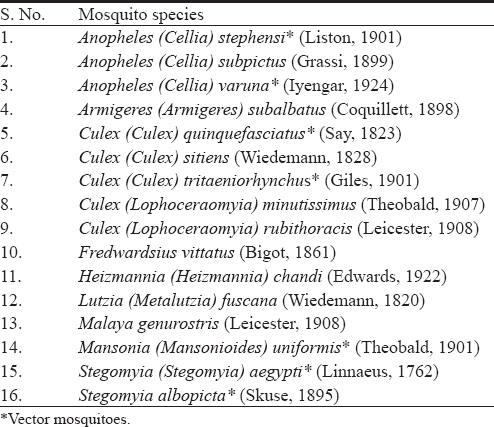 Out of the 16 species, six belonged to mosquito vectors. The collection included malaria vector, Anopheles stephensi; Japanese encephalitis vector, Culex tritaeniorhynchus; Bancroftian filariasis vector, Cx. quinquefasciatus; Brugian filariasis vector, Mansonia uniformis; and dengue and chikungunya vectors, Stegomya albopicta and St. aegypti. Stegomya albopicta was the most predominant species observed constituting 54% of the catch, followed by Cx. quinquefasciatus, An. stephensi, Cx. tritaeniorhynchus, and St. aegypti constituting 10.5, 6, 3 and 1.2%, respectively. Apart from vector species many non-vectors such as Heizmannia chandi, An. subpictus, An. varuna, Cx. sitiens, Cx. minutissimus, Cx. rubithoracis, Fredwardsius vittatus, Lutzia fuscana, Malaya genurostris and Armigeres subalbatus were also present in the study area. In Kavaratti Island, the capital of Lakshadweep, a non-vector species of sandfly, Sergentomyia (Parrotomyia) babu was observed during the indoor resting collection. 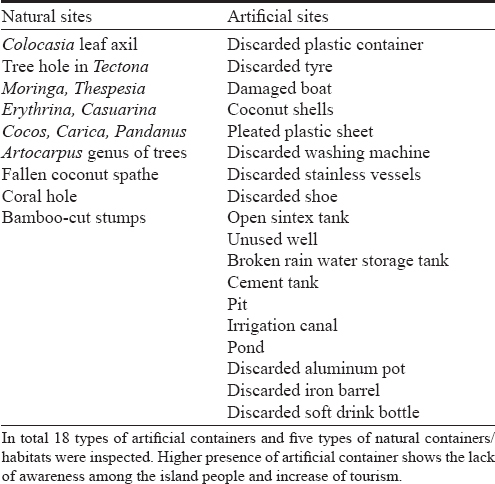 The major breeding sites which supported various mosquito species included, discarded plastic containers, tree holes, open sintex tanks (water storage tanks), unused wells, discarded tyres, discarded iron pots, unused and damaged boats, cement tanks, pleated plastic sheets, coral holes, pits and irrigation canals, discarded washing machines, and Colocasia plant leaf axils. Breteau index ranged between 65.3 and 110, CI ranged between 63.64 and 72.41; and HI ranged between 38.46 and 70 among the various islands. Interpretation & conclusion: Entomological indices such as house index (HI), breteau index (BI) and pupal index (PI) were high in all the nine islands and exceeded the threshold levels specified by WHO, indicating high risk for dengue virus transmission in case of outbreaks. Occurrence of vector as well as non-vector species indicates that the global change in climate is causing notable changes in terms of breeding of vector and non-vector species in the islands. With the reported cases of VBDs and the presence of vectors species in Lakshadweep Islands, a stringent control measure needs to be implemented at the Lakshadweep Islands. Extensive surveys were carried out from November 2017 to January 2018 (post-monsoon season) randomly in the nine inhabited islands of Lakshadweep for conducting faunastic studies on mosquitoes, to know the breeding and resting preference of mosquitoes. Both immature and adult collections were carried out by standard/appropriate sampling techniques as per WHO methods. The study islands included, Kavaratti, Agatti, Chetlat, Bitra, Amini, Kadmath, Andrott, Kalpeni and Kiltan. 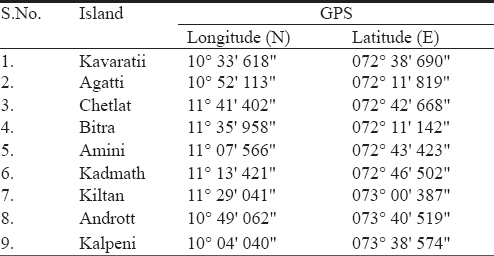 The GPS coordinates of all the nine islands are indicated in [Table 1]. In total 3356 mosquitoes were collected from the nine islands which included 16 species from nine genera. The predominant breeding sites are displayed in [Table 2]; and the list of mosquito species (vector as well as non-vector species) collected and their distribution island-wise is given in [Table 3] and [Table 4], respectively. Out of the 16 species collected, six species are known vector mosquitoes in India. The different type of vectors found in the islands included, malaria vector, An. (Cellia) stephensi; Japanese encephalitis vector, Cx. (Cx.) tritaeniorhynchus; Bancroftian filariasis vector, Cx. (Cx.) quinquefasciatus; Brugian filariasis vector, Ma. (Mansonioides) uniformis; dengue, Zika and chikungunya vectors, St. albopicta and St. (St.) aegypti. Stegomya albopicta, is the predominant species which constituted around 54% of the total collected mosquitoes. Other vectors like Cx. quinquefasciatus, An. stephensi, Cx. tritaeniorhynchus, St. aegypti constituted 10.5, 6, 3 and 1.2%, respectively of the catch as shown in [Figure 1]. The total number of mosquitoes from various breeding habitats in nine islands are shown in [Figure 2] and breeding habitats are shown in [Figure 3], and [Table 5]. 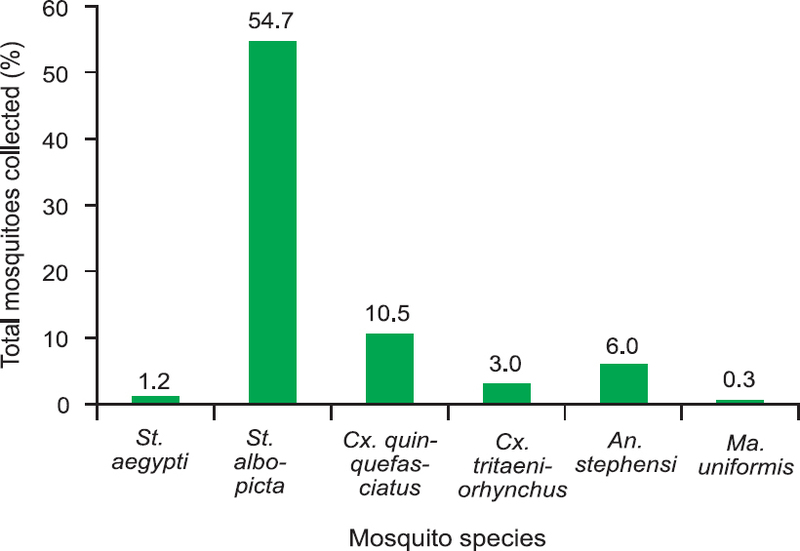 Individual island-wise comparison of the mosquito species revealed that St. aegypti is present only in Kavaratti and Andrott Islands, whereas St. albopicta and Cx. quinquefasciatus are present in all the islands. 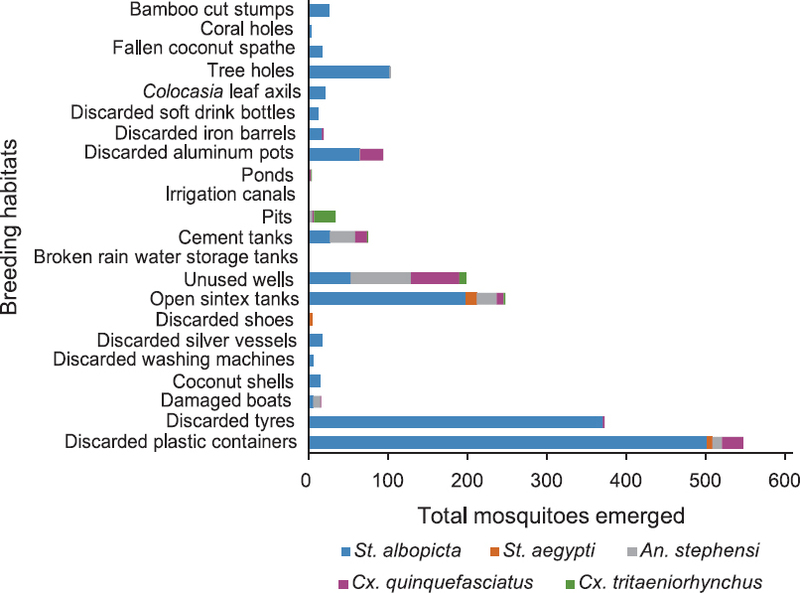 Figure 1: Percentage of collected mosquito vectors in nine islands of Lakshadweep Islands. Figure 2: Total number of vector mosquitoes emerged from collected immatures in different habitats. 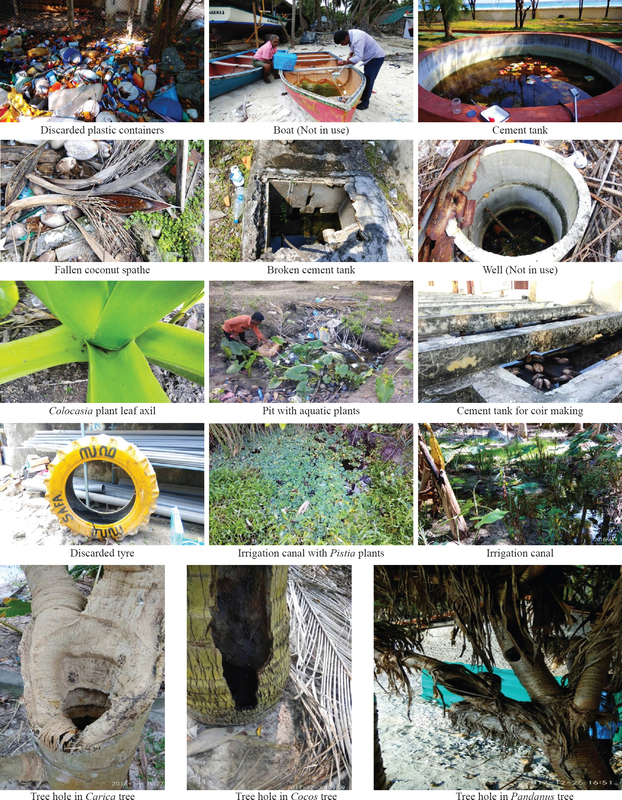 Figure 3: Common breeding habitats of mosquito immatures in Lakshadweep Islands. The entomological indices are summarised in [Table 6]. The result of the indices indicated that BI (110) and HI (70) were very high in Bitra Island in comparison with other islands. Similarly, the CI (72.41) was very high in Andrott in comparison with other islands. Japanese encephalitis vector, Cx. tritaeniorhynchus was observed only in five islands, namely Chetlat, Amini, Kiltan, Andrott and Kalpeni. Surprisingly, An. stephensi was seen in all the nine islands surveyed. Further, Ma. uniformis the vector of Brugian filariasis was observed in Kalpeni Island only. Among the 16 mosquito species, 12 were present in Amini, Andrott and Kavaratti Islands and nine in the Kadamat and Kalpeni Islands. The presence of same type of mosquito species in these islands, reiterates uniform breeding sites, suitable climatic conditions and similar geographical locations among these islands. In Chetlat and Kiltan Islands, total seven species of mosquitos were observed. In Agatti, seven species of mosquitoes were seen, while in Bitra only three species were observed which was lowest in comparison to other islands. Subramaniam H, Ramoo H, Sumanam SD. Filariasis survey in the Laccadive, Minicoy and Amindivi Islands, Madras state. Indian J Malariol 1958; 12: 115–27. Roy RG, Joy CT, Hussain CM, Mohamed IK. Malaria in Lakshadweep Islands. Indian J Med Res 1978; 67: 924–5. Sharma SK, Hamzakoya KK. Geographical spread of Anopheles stephensi, vector of urban malaria, and Aedes aegypti, Vector of dengue/DHF, in the Arabian Sea Islands of Lakshadweep, India. Dengue Bull 2001; 25. Ali SMK, Rajendran R, Regu K, Mohanan MK, Bora D, Dhariwal AC, et al. Study on the ecoepidemiology of chikungunya in UT of Lakshadweep. J Commun Dis 2009; 41(2): 81–92. Sameul PP, Krishnamoorthi R, Hamzakoya KK, Aggarwal CS. Entomo-epidemiological investigations on chikungunya outbreak in the Lakshadweep Islands, Indian Ocean. Indian J Med Res 2009; 129(4): 442–5. Barraud PJ. The Fauna of British India, including Ceylon and Burma. Diptera V. Family Culicidae. Tribes Megarhinini and Culicini. London: Taylor and Francis 1934; p. 463. Bataille A, Cunningham AA, Cruz M, Cedeno V, Goodman SJ. Seasonal effects and fine-scale population dynamics of Aedes taeniorhynchus, a major disease vector in the Galapagos Islands. Mol Ecol 2010; 19(20): 4491–504. Sunish IP, Shriram AN, De A, Vijayachari P. Malaria in the Andaman and Nicobar Islands: Challenges and opportunities for elimination. Asian Pac J Trop Dis 2015; 5(10): 837–40. Surendran SN, Sivabalakrishnan K, Gajapathy K, Arthiyan S, Jayadas TTP, Karvannan K, et al. Genotype and biotype of invasive Anopheles stephensi in Mannar Island of Sri Lanka. Parasit Vectors 2018; 11: 3. Sivan A, Shriram AN, Sunish IP, Vidhya PT. Studies on insecticide susceptibility of Aedes aegypti (Linn) and Aedes albopictus (Skuse) vectors of dengue and chikungunya in Andaman and Nicobar Islands, India. Parasitol Res 2015; 114(12): 4693–702. Fahri S, Yohan B, Trimarsanto H, Sayono S, Hadisaputro S, Dharmana E, et al. Molecular surveillance of dengue in Semarang, Indonesia revealed the circulation of an old genotype of dengue virus serotype-1. PLoS Negl Trop Dis 2013; 7(8): e2354. Nusa R, Prasetyowati H, Meutiawati F, Yohan B, Trimarsanto H, Setianingsih TY. Molecular surveillance of dengue in Sukabumi, West Java province, Indonesia. J Infect Dev Ctries 2014; 8(6): 733–41. Silva FD, dos Santos M, Corrêa RGCF, Caldas AJM. Temporal relationship between rainfall, temperature and occurrence of dengue cases in São Luís, Maranhão, Brazil. Cien Saude Colet 2016; 21(2): 641–6. Sharma RS, Ali S, Dhillion GPS. Epidemiological and entomological aspects of an outbreak of chikungunya in Lakshadweep Islands, India, during 2007. Dengue Bull 2008; 32: 178–85. Shriram AN, Krishnamoorthy K, Sehgal SC. Transmission dynamics of diurnally subperiodic lymphatic filariasis transmitted by Ochlerotatus (Finlaya) niveus in the Andaman and Nicobar Islands. Indian J Med Res 2008; 127(1): 37–43. Guagliardo SA, Barboza JL, Morrison AC, Astete H, Vazquez-Prokopec G, Kitron U. Patterns of geographic expansion of Aedes aegypti in the Peruvian Amazon. PLoS Negl Trop Dis 2014; 8(8): e3033.